The CoffeeShop Blog: CoffeeShop 16x20 Photographer Storyboard Set #6! CoffeeShop 16x20 Photographer Storyboard Set #6! 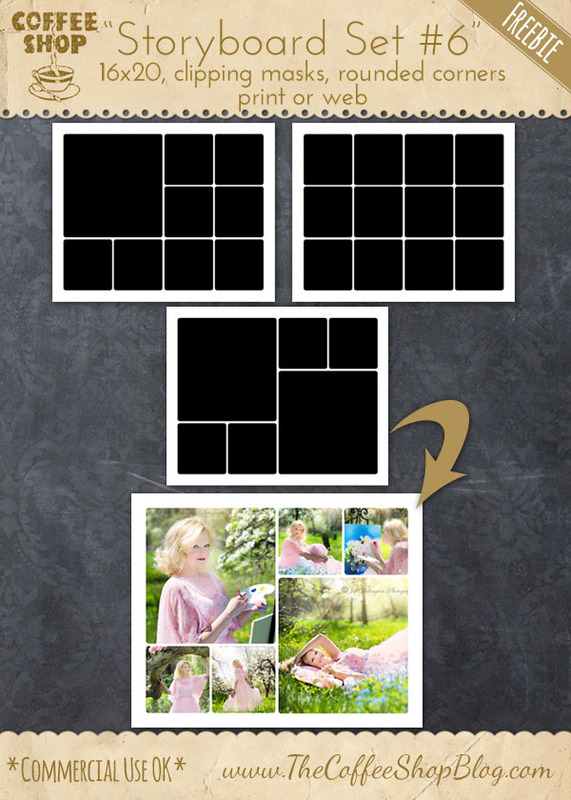 Today I have a new 16x20 photographer storyboard set with rounded corner photo-cutouts to share with you. These three storyboards are layered psd files for Photoshop/PSE so you can add your images using clipping masks (tutorial and free action). You can also flip these 90 degrees (before adding your images) for three additional storyboard options. A special thanks to Jill Wellington (Etsy Shop, Facebook, Blog, YouTube Videos, Pixabay) for allowing me to use her "Vintage Val" images in my storyboard example above. Download the CoffeeShop 16x20 Storyboard Set 6! You can also download it here.